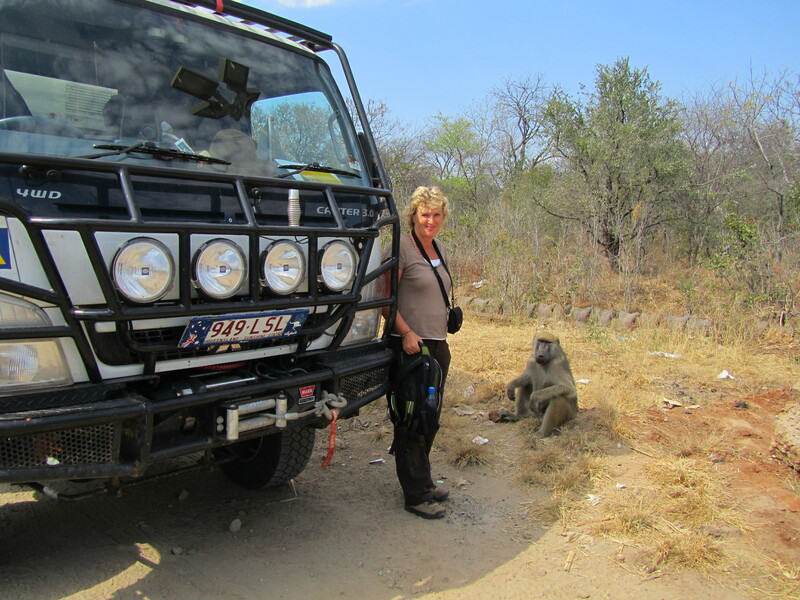 Leaving Zimbabwe and entering Zambia at Kariba was a very relaxed affair and all up took less than 2 hours. 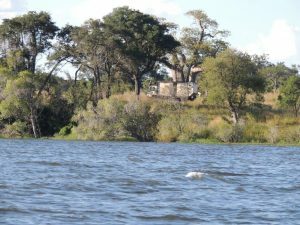 Zambia is Africa’s unknown travel destination and is blessed with natural tourism attractions. 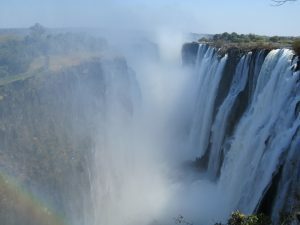 Most tourists only visit Victoria Falls and fly back to either Botswana, Namibia or South Africa. 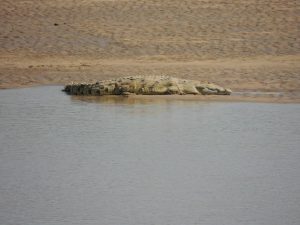 But it has many more attractions based on wild life, scenery and wilderness experiences. Its population is friendly, and the country is safe. Zambia has some of the biggest Game Reserves in the world and we are going to visit a few. Like in Botswana here we bush camp without any fences allowing animals to roam around our truck. 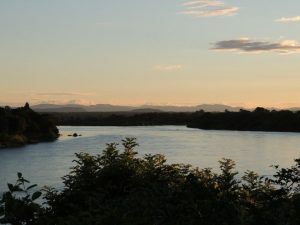 Our first stop in Zambia (former Northern Rhodesia) was Lower Zambezi National park. 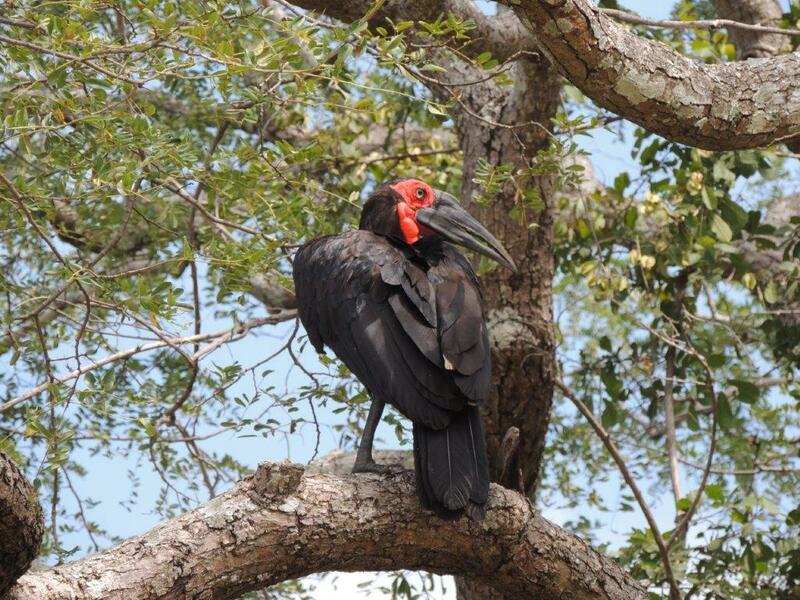 This park has a 120km Zambezi river frontage with lots of bush camping possibilities. 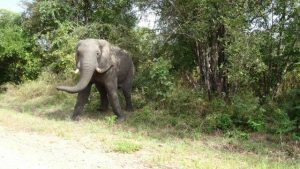 We are told the area has around 2200 elephants alone. The 4WD track in was rough and muddy after recent rains. We travelled through small communities, passed people on bikes, woman carrying wares on their head and we crossed some rivers. THIS IS AFRICA, a land of happiness, heat, humidity and freedom. Waking up in the morning watching the sun rise or at night watching the sunset, watching elephants walking past your campsite really makes the Lower Zambezi something magical. 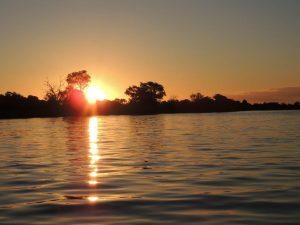 Lower Zambezi is still relatively undeveloped, its beauty lying in its wilderness state. 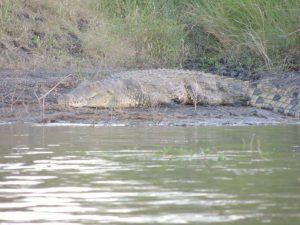 The diversity of animals is not as wide as the other big parks, but the opportunities to get close to game wandering in and out of the Zambezi channels are spectacular. 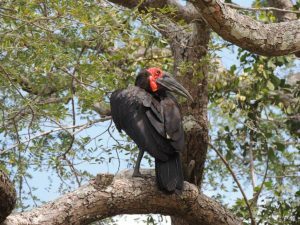 The Park lies opposite the famous Mana Pools Reserve in Zimbabwe, so the whole area on both sides of the Zambezi River is a massive wildlife sanctuary. Most of the game is concentrated along the valley floor. Enormous herds of elephant, up to 100 were seen the day before we arrived at the river’s edge. 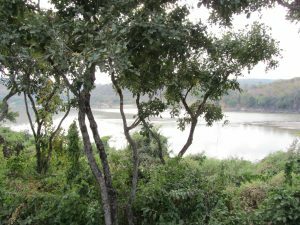 The Park has a good population of lion and leopard, but despite hearing them we never saw any. 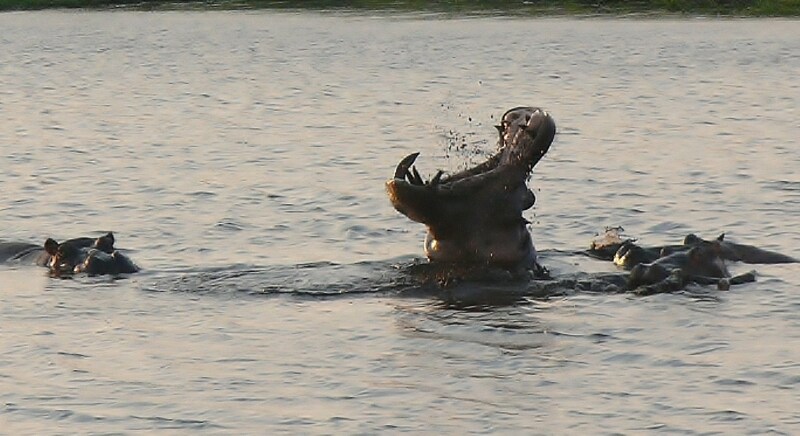 During our stay we met a 3-week-old Hippo abandoned by its mother after it got attacked by a crocodile. 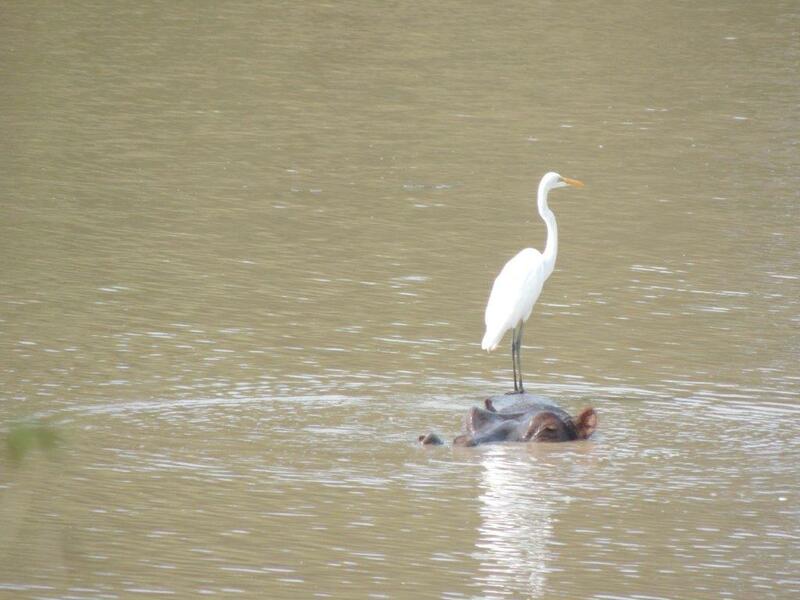 Lucky the local villagers took care of the baby hippo. For us it was time to head to Lusaka and meet our new South African friends living in Lusaka for a Braai and watch a game of Polo Cross. We also required an urgent top up on food and beverages, and a proper HOT shower. It was only a few hours drive to Lusaka and this town seems to be booming. (Our last visit was in 2010). New buildings are going up everywhere and many chain stores and shopping malls are springing up all over the sprawling suburbs. The road development isn’t quite keeping up, so traffic is still slow going through town. 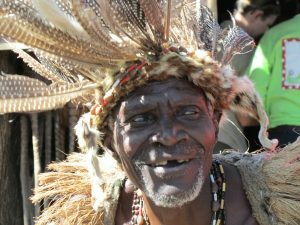 Well over 60% of its 2 million inhabitants are unemployed, but there are surprisingly few beggars. Although petty theft occurs, most people try to make an honest living selling their wares or services, always with a friendly smile. The markets are a hive of activity as the thousands of stalls are set up, upgraded and cleared away every day. 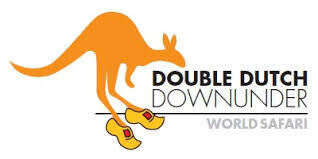 The markets are a myriad of motor spares dealers, restaurants, hairdressers, fishmongers, fruit sellers and rows and rows of stalls selling discarded clothing from charities in Europe, USA and Australia given as aid to Africa by the bale. 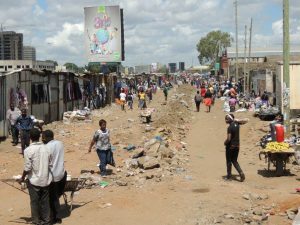 Lusaka was a convenient stop to do shopping, catching up with our new friends we met while in Mozambique and a bit of R &R and visiting Polo Cross. We wondered why we had to pay carbon Tax in a country where everyone uses charcoal or wood every day. 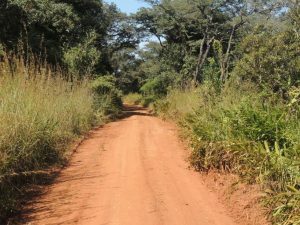 Kafue is dissected by the main M9 or Mongu Road, a good tar road which runs all the way from Lusaka. Once in the park the tracks are challenging after rain and the black-cotton soil is notorious and plentiful. 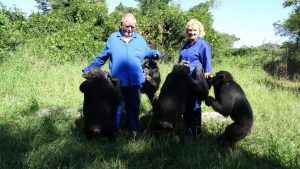 Many of the chimpanzees were confiscated from poachers who attempted to smuggle them into Zambia for sale as pets or bush meat. 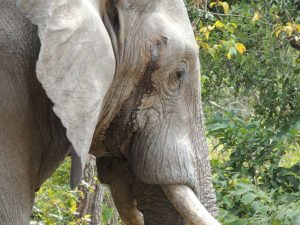 But some also came from dilapidated and war-torn zoos and circuses around the world. 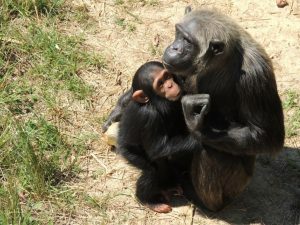 The chimpanzees live in 4500-acre forested enclosures and get fed twice daily and checked for any illness. 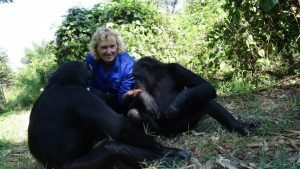 For us the walk and play with the chimps was an unforgettable experience and now has given us the pleasure of walking with Gorillas (Rwanda) Orangutan (Borneo) and Chimpanzees (Zambia). 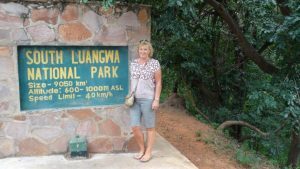 South Luangwa and North Luangwa National park. 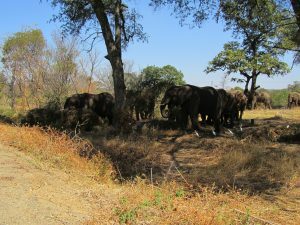 We missed this park in 2010 and were told it is one of the greatest wildlife sanctuaries in the world. The concentration of animals around the Luangwa River, and its oxbow lagoons, is among the most intense in Africa. 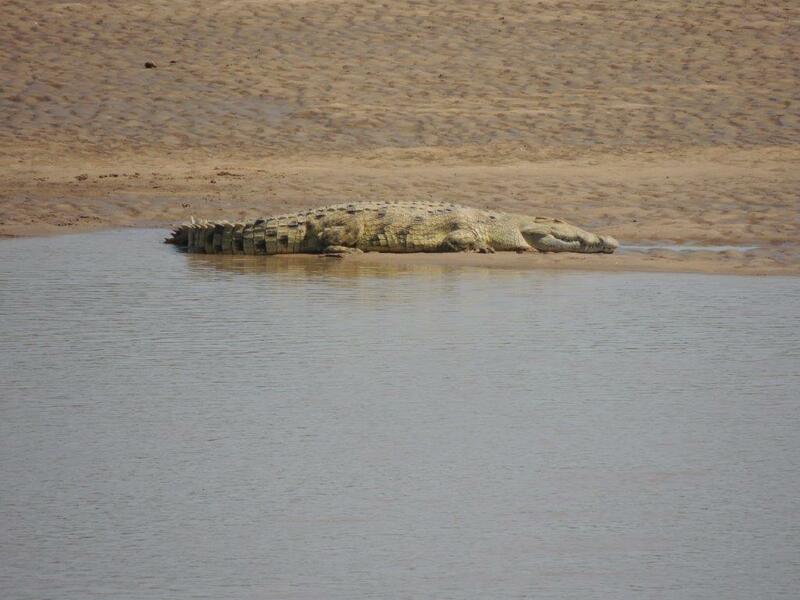 The Luangwa River is the life-blood of this 9059 km2 Park. 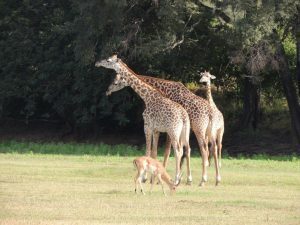 Over 60 different animal species are in the park. The only notable exception is the rhino and cheetah, sadly poached to extinction. 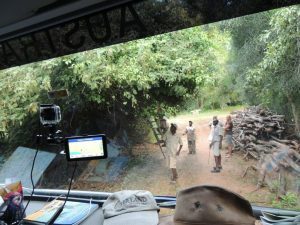 We did see animals, but it is not the most intense wildlife we have seen in Africa. 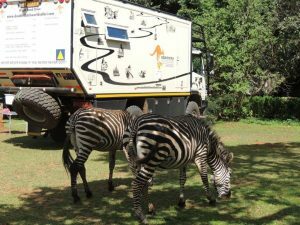 We also had our first disappointment: the rangers would not allow our truck inside the park. 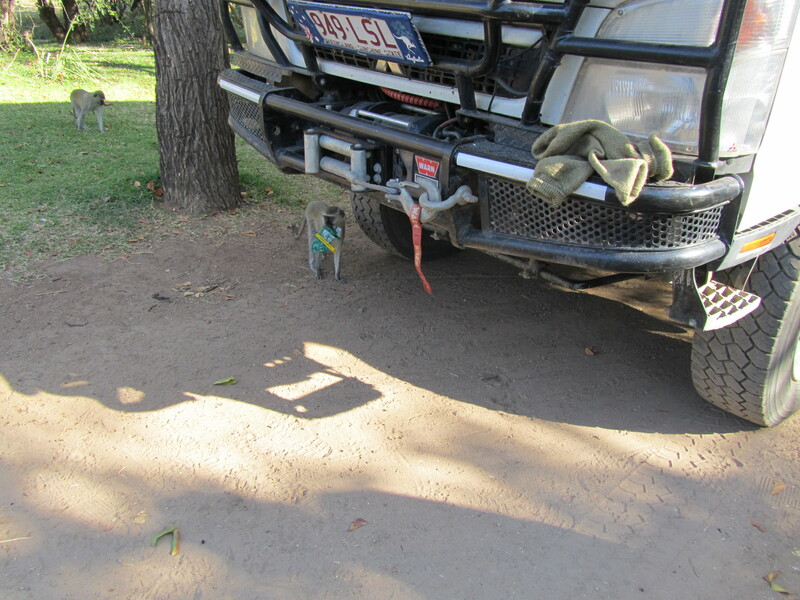 We were told only mid and large size 4WD vehicles were allowed in, no trucks and no 2WD. 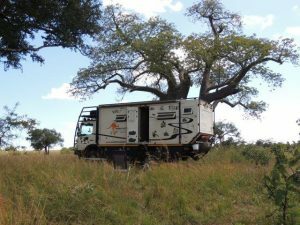 This was pushed by the game drive operators who don’t want too many cars in the park and like to fill their game spotting vehicles. Just a shame that the brochures do not mention these restrictions, so be forewarned. 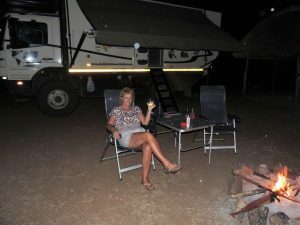 Luckily 2 South African campers at our campsite allowed us to join them. 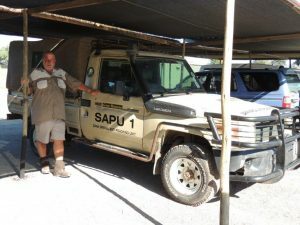 2 days of game drives resulted in meeting just 6 other private cars. It was made clear a lot of money is made by Fly in Fly out guest from Europe/USA paying between 250USD and 600USD per night. 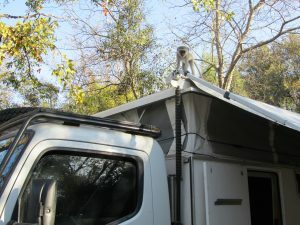 We stayed just outside of the park at Wild Life Camp a magic location right on the river. 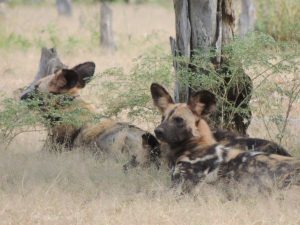 At night the camp gets frequented by elephants, hippos, lions and the occasional pack of wild dogs and hyena’s. 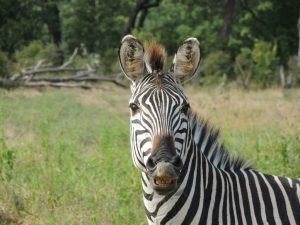 (No fences here) Like in most other parks in Africa the International tourist pays double or even triple for the privilege of visiting the major tourist spots/parks. (Isn’t this racism?) 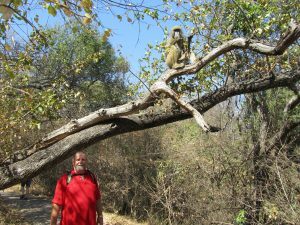 Our 4-week Zambia tour has come to an end. 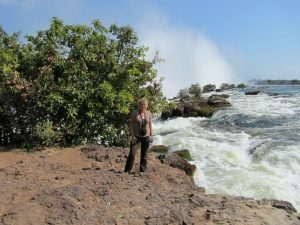 Zambia where nearly 30% of the land is National Park, an unknown destination to most, a country visited mostly by day visitors (Victoria Falls) and overlanders en route to either Botswana/Namibia or Malawi and Tanzania following the coca cola trial. 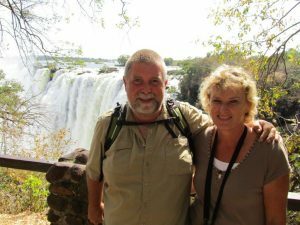 For us it was our 3rd visit to Zambia and we enjoyed it. 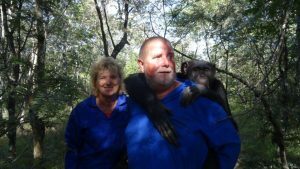 No, it is no comparison to the wild life in South Africa-Botswana and Namibia but we enjoyed the bush camping where animals, both predators and prey wander through unfenced campsites, the sounds of the jungle, swapping stories around the campfire, and the friendly people of Zambia. 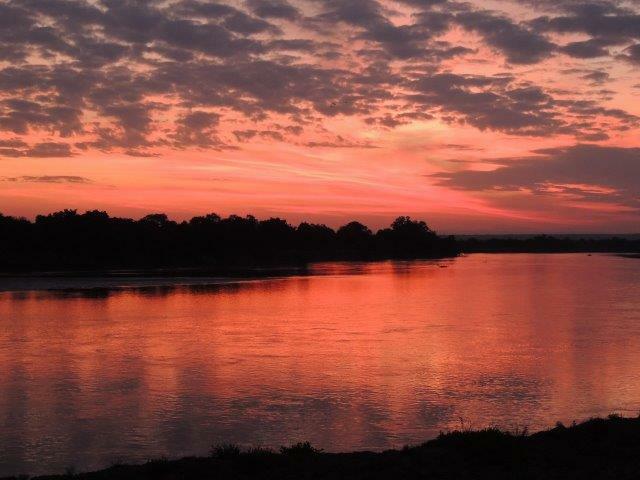 The mighty Zambezi River, the Kafue and Luangwa rivers all make this a special destination. On the negative once of the main road the roads are in poor condition and even some highways are so bad that instead of driving on the left-hand side of the road we drove left of the road. On our last day Clary got diagnosed with Malaria and as soon as we arrive in Malawi we will get a second opinion. Visa 30 days 50.00 USD PP only accept USD not able to pay in local currency!!! Carbon Tax 20USD (funny in a country which we enter with a clean engine while the whole country burns wood and charcoal 24/7 and truck are all Euro ZERO we pay carbon tax???? ) Road Tax we paid for our truck 125USD (again only accept USD) International visitors pay up to 5 times as much for entrée fees than the locals do. Carnet de Passage is accepted but also Temporary Import Permit for a vehicle and this is free. We left at 9am for the short drive to the Zambia/Botswana border. 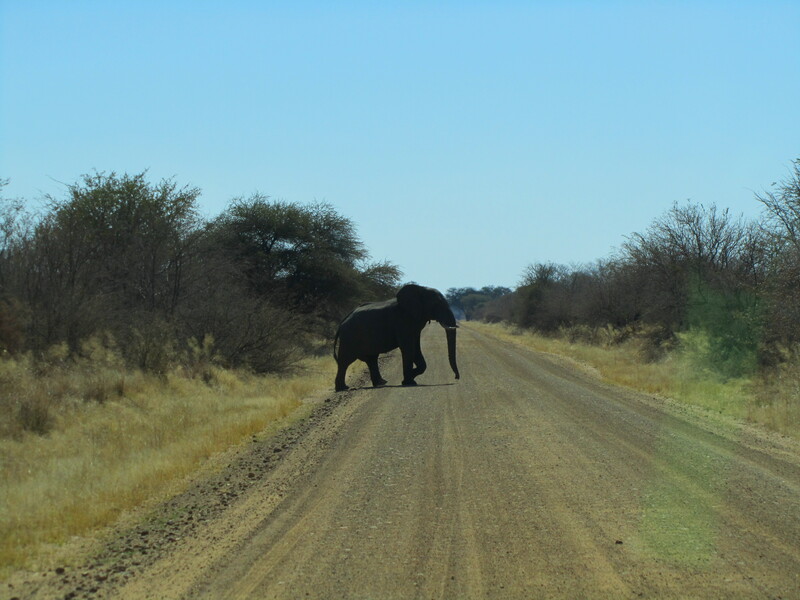 Botswana was a breeze and in 15 minutes we were out of Botswana. 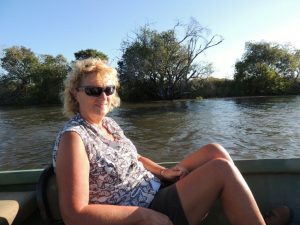 Up to the river where we had to cross the mighty Zambezi. The ferry did look like the ones you see on the news after they have gone down. Anyway, after paying some extra money, we finished up in front of the queue; to the disgust of the people not paying a little extra. 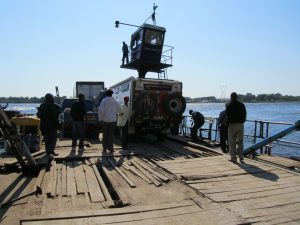 Right or wrong, it still took us 2 hours to get on the Ferry. And then there were the Zambians who would like to help. While we were in the queue, our fixer got arrested! The policeman told me he was a criminal. That did not bother 200 others who tried to get our services. Once we arrived at the other end they were already waiting for us. And as it was so hectic and so many cars, people and sales people selling anything from monkeys to money on the black money market, we decided to stick with our fixer. 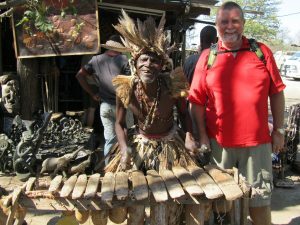 He guided us through the maze of offices, Immigration, Visa (USD$160 for double entry), Customs, Carbon Tax (USD$20), Road Tax, (USD$42) and compulsory 3rd party insurance (USD$75). Our full cover Loyd’s insurance was not good enough! We spent a week’s budget before we entered Zambia. 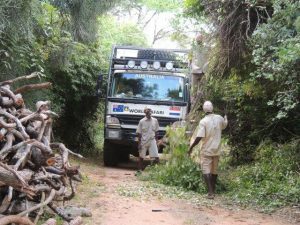 The insurance was initially USD$150 for our truck but then I realised that the 4 guys and the insurance company worked together. I had to make myself the angry Dutchman and I told them I was aware what they where up to. To cut a long story short I only paid USD$75 for the same insurance. The exchange rate for Kwacha is around 5000 for USD$1. Our fixer wanted to sell us the currency for 4500. 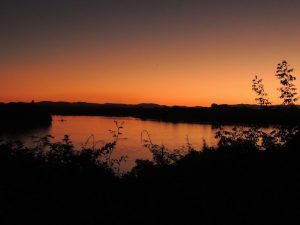 It is illegal to change money on the black market in Zambia, however the bank is no longer open because it could not compete with the black market and the nearest ATM is 80km away in Livingstone. Some of the fees have to be paid in Kwacha (local Currency), so we asked the police who in turn recommended a good money dealer! Naturally it was “a friend of his” but at least we got 5000 Kwacha for USD$1. It was absolute mayhem at the border and after 2.5 hours trying to work out where to go to next, we had all the paperwork that we needed. We paid our fixer USD$10 but as he did very little, we will do it ourselves next time. So before even entering Zambia, we already forked out USD$307. Then a fight broke out between border patrol and locals, trucks started to beep their horns. The customs officer looked inside the truck and liked the lollies, beer and food we had in the fridge. “No mate, that`s ours. To us the whole area seemed to be lawless and despite all the police and army personnel around, I am sure they all get a slice of the action. But what an unforgettable experience! Clary said I got pretty angry when I realised we were overcharged for the insurance. Oh and one last thing – we have no policy, but are we insured? Who knows? So not sure what is covered but lucky we still have full cover from Europe. The gateman did not know what to do? He still had our Carnet; in the panic that followed he opened the gate gave me the Carnet and told me to go without checking anything else. As we drove away from the border we checked if we had everything and if nothing was missing. 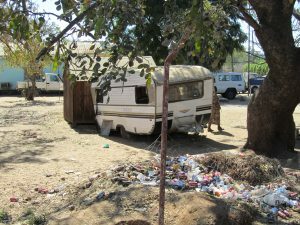 Welcome to Zambia! 5km up the road we came across a police road block; then 10km up the road another police road block and 20km an army road block. It was shaping up for an interesting day. The 2 papers they all wanted to see were the Carnet and the Third Party Insurance. 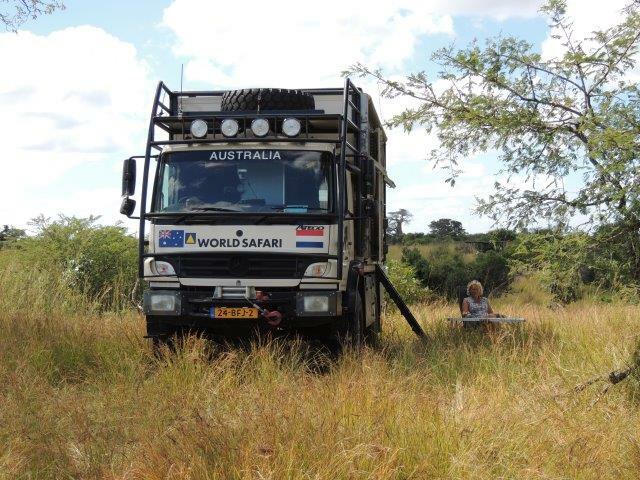 An hour later we arrived in Livingstone and started looking for a camp site. Not much luck at first because our truck was too high for the Waterfront Lodge campsite and the Bushman`s Lodge. 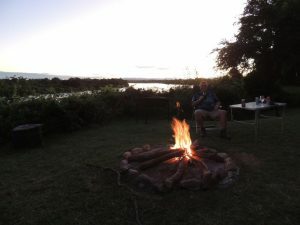 Third time lucky we found a spot at the Livingstone Safari Lodge. We had had enough for one day and we set up camp, organized firewood and made ourselves comfortable. 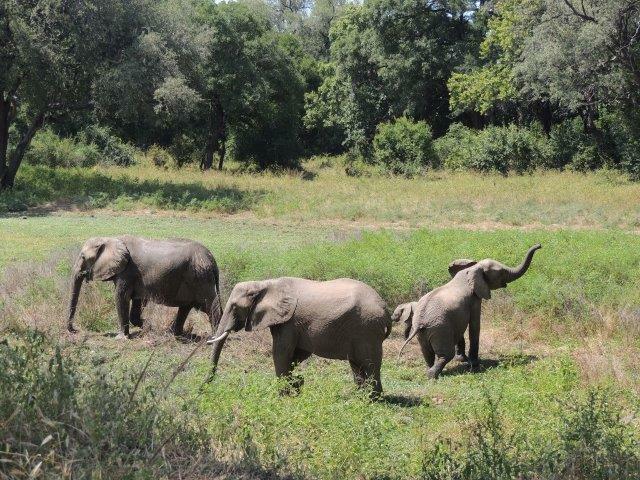 We went over to the main attraction in Livingstone. 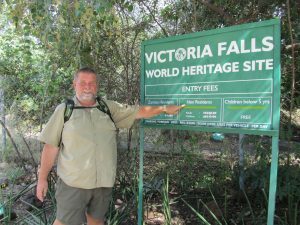 Victoria Falls – Livingstone is a thriving town with a population of 140,000. 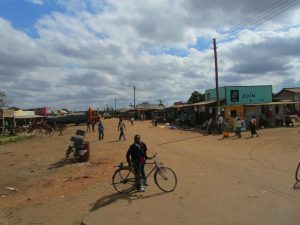 The town is full of tourists all concentrated around the main Mosi-oa-Tunya Road. 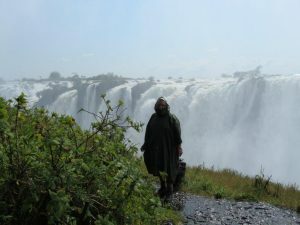 The magnificent Victoria Falls is what we`re here for. 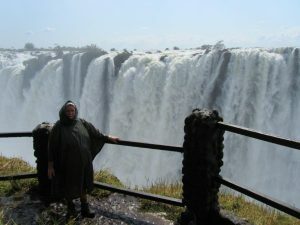 Known to locals for centuries as Mosi-oa-Tunya (the smoke that thunders) the falls are only 10km south of Lvingstone and only 4km from our campsite. At almost 2km across and over 105 meters high, they are one of the worlds highest and undoubtedly most awe inspiring waterfalls. When we drove towards Livingstone from the border the spray could be seen from more than 30km away. 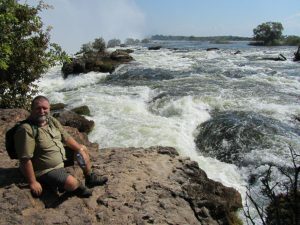 We are camping on the Zambian side and we are told that this is the side you can get the closest to the falls. Entry fee to the falls is USD$20 per person and USD$5 for the car. 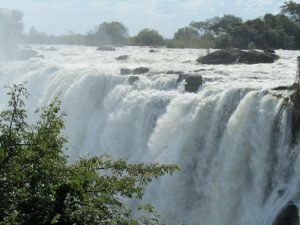 Mosi- oa-Tunya National Park, where the falls are located, stretches from the falls for about 12km along the Zambezi River which is home to lots of wildlife. 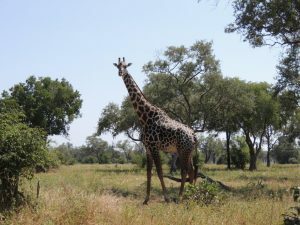 Including zebra, giraffe, elephant, and the only white rhino`s in Zambia. Our photos will tell the story. 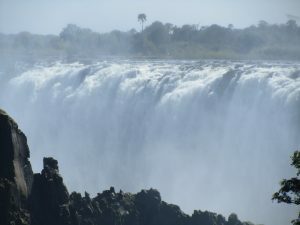 Unfortunately the wet was so big that the falls are roaring and the spray blocks most of the view. From here we went across the border, but not before we nearly killed a baboon that pulled our windscreen wiper off the car. Lusaka is not one of the most beautiful cities we have been to. 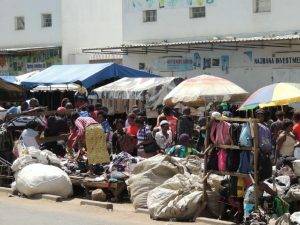 First we have to do shopping so we left the campsite only to become stuck in Lusaka`s Saturday Morning traffic. I have no idea why they have traffic lights here as it does not matter ( if it is green or red everyone ignores it.) Overtaking happens right, left over the footpath and the medium strip. It is a matter of those with the most courage win. Lucky we have a truck and a 150DB air horn. First gear lots of noise and whatever you do DON`T stop. The diff noise has now become so bad that the noise starts straight after leaving and does not need any time to get warm anymore. Early afternoon we returned back and had a relaxed afternoon at Eureka camp site. 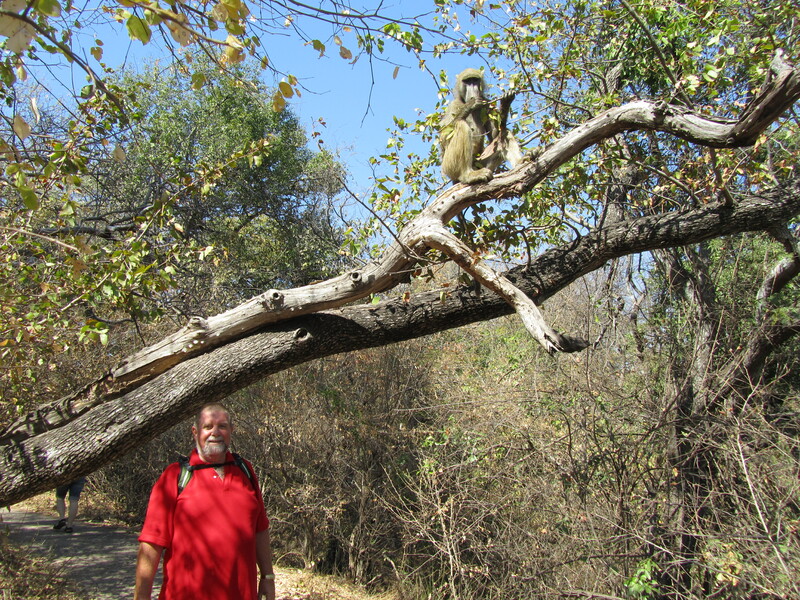 The next couple of days we explored Lusaka, the capital of Zambia. 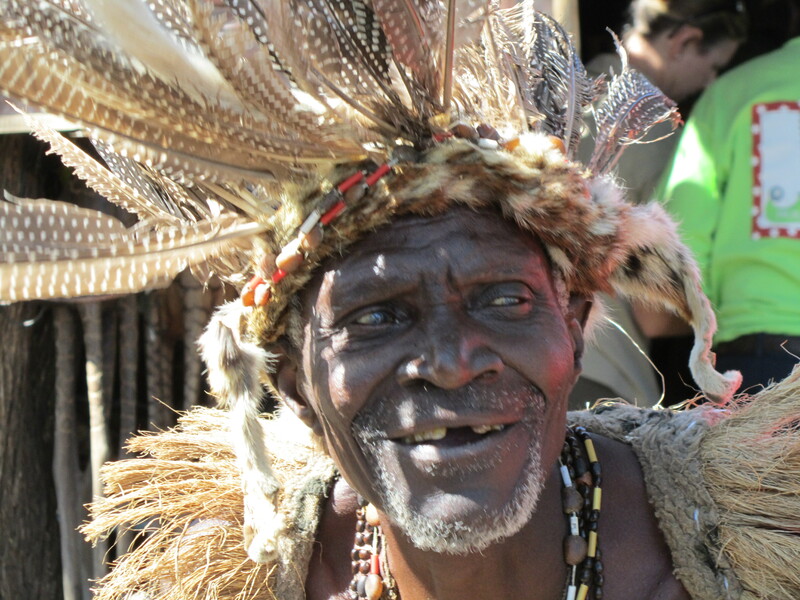 It is home to 2.5million people and has one of the fastest growing populations on the continent. The city is one of contrast with people living on the medium strip, begging for money, flourishing markets, a central business district and top shopping malls with good well stocked supermarkets. Local arts and crafts are found at the Pakati Market at the Arcades Mall every Sunday. (This is a good shopping centre with lots of parking and a well stocked up Spar supermarket). It was time to leave Lusaka and it took us 1.5 hours to get through the hectic traffic in Lusaka. No rules but just make sure you keep moving. Whatever you do DO NOT STOP. We tried to find the tourist office but gave up in the end. It was a 3 hour drive to the Luangwe River. The campsite is a beauty and we were welcomed by a Dutch/South African couple and before I knew it we had firewood supplied, fire lit and the donkey for the hot showers going. We really love this continent. As we had set up camp the local villagers came to say hello and instead of asking for food or money they where after pens for the school. Tonight we are missing the Spain vs Portugal match because this area has no TV reception. But it will mean a nice night around the campfire. The security guard made sure the fire was still going this morning. The view over the river was absolutely superb. In Zambia you can purchase fuel on the road in anything from Coke bottles, whiskey bottles to 20lt jerry cans. It is quite funny as you see one person with a sign USD 1.10 the next is USD 1.09 and it goes on. After a few km it comes down to USD 1.01. 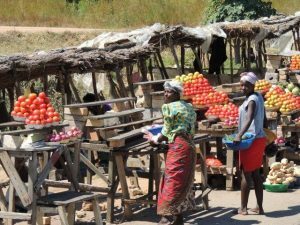 In Zambia (in fact read Africa) you can purchase anything along the road side from mirrors, to lounges, battery charges, tyre inflaters, fire wood, charcoal, fruit and veg. It is real Africa and the women seem to do all the work? They walk up to 30km a day to do shopping. 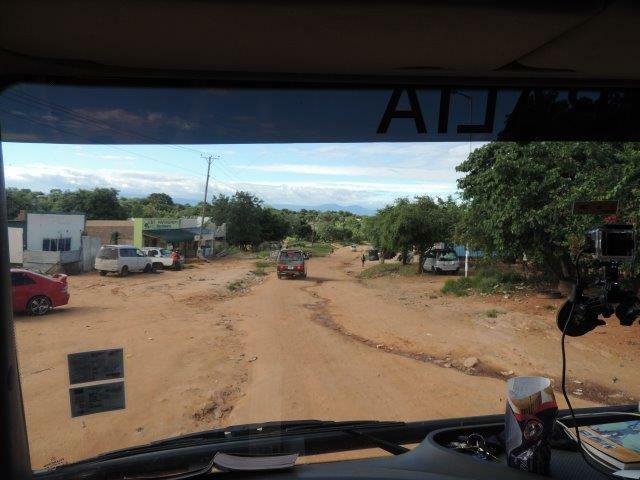 The scenery changed a little as we travelled along the Mozambique border. it became more tropical with the odd banana plantation and palm trees appearing. Time to move on again to our next stop Chipata, which is 22km from the Malawi Border. The drive was scenic and we passed through many villages where the kids where asking for pens and note books. 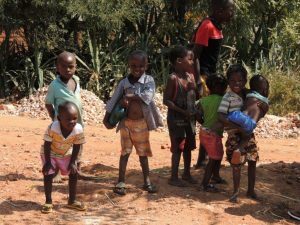 As everywhere in Africa the main road has to be shared with kids and locals to and from school and shops. It is quite a challenge trying to avoid potholes, kids, bikes and local busses, some doing 120km per hour. We saw many bicycles today and we are told that many were donated by European charities. 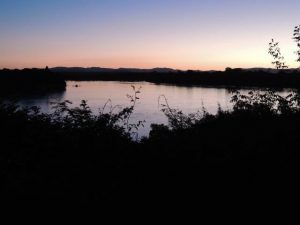 2 days Chipata was enough time to visit Malawi.